Homemade applesauce has become a hobby an addiction a passion of mine. Every few weeks I buy a 15 lb box of “scratch and dent” apples, and it sits on the counter for 3 days while I squirm and wish it didn’t exist. Why did I saddle myself with all these apples aGAIN? But then…I finally tackle it, and as I wash the apples their gleaming, shiny skins start improving my mood. Then I get into a rhythm while I chop them up. I use a cool old-school gadget called a Foley food mill (you’ll see it in a sec), so I don’t have to peel or core the apples! I just cut them into quarters or sixths, depending on their size. Now I’m really having fun, trying to get the apples sliced with the least number of cuts. I mean, what’s more fun than efficiency, amIright? Then it’s hands off while they simmer and steam and fill the kitchen with apple smells. I cook them for about an hour and only stir and mush them around once, at the halfway point, to help them cook evenly. You could totally do this step in a crockpot or Instant Pot, too! Now before I brag about my Foley food mill, don’t worry, if you don’t have one, you can still make homemade applesauce! 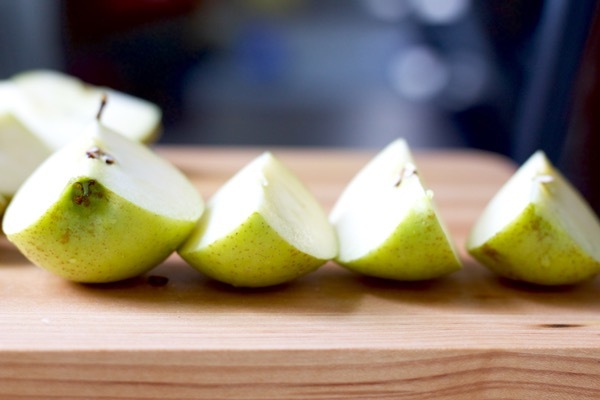 Just peel and core your apples before cooking. Then, you can mash them by hand and leave the sauce chunky or put the cooked apples in a food processor or blender for smoother applesauce. That’s how I do it when I make it for baby food! On to the bragging. I can always recruit a few kid helpers when it’s time to turn the cooked apples into sauce, because cranking it through the Foley food mill is so darn fun and satisfying. It’s totally worth $25 if you have space for it! The skins and seeds can’t fit through the sieve holes, but all that gorgeous pulpy apple goes through. 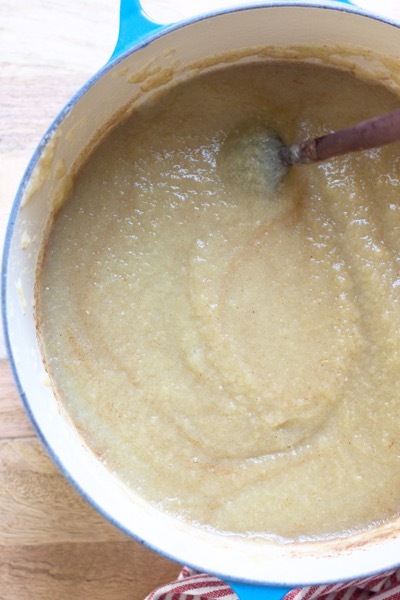 All your homemade applesauce needs is a swirl of cinnamon if you’re so inclined! 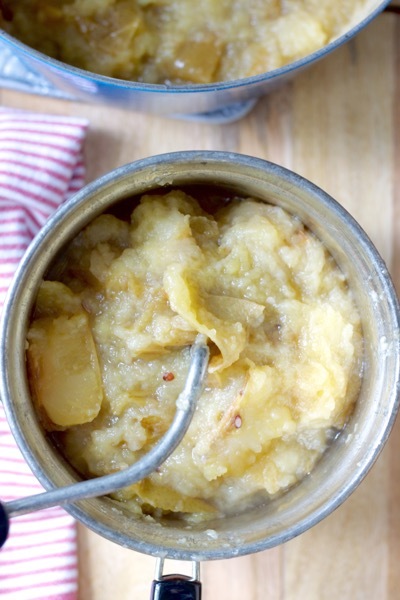 The finished product is thick, intensely apple-y, naturally sweet, and overall much more interesting than store-bought applesauce (which is fine, but is often sweetened and can be watery or grainy). It ranks up there with homemade bread on a list of my favorite worth-the-extra-effort comfort foods! Plus, it freezes beautifully and makes a healthy gift or a delicious addition to a meal delivery – especially if there are kids in the family – or anyone who is vegan/grain-free/sugar-free/etc! This post contains affiliate links, which helps support Bet On Dinner, at no cost to you. Place prepared apples and water in a large (6-quart) pot. Heat to boil the water and then reduce to low to medium-low and simmer, covered, for 30 minutes. Stir and mush the apples, moving the apples on the top to the bottom, then simmer 30 minutes more until soft and mushy. Spoon the apples into a Foley food mill set over a large bowl or another pot. Turn the crank (alternating about 5 clockwise turns with 1 counterclockwise so that the grate doesn’t get clogged) until just skins and seeds are left in the food mill and the bowl is full of applesauce! 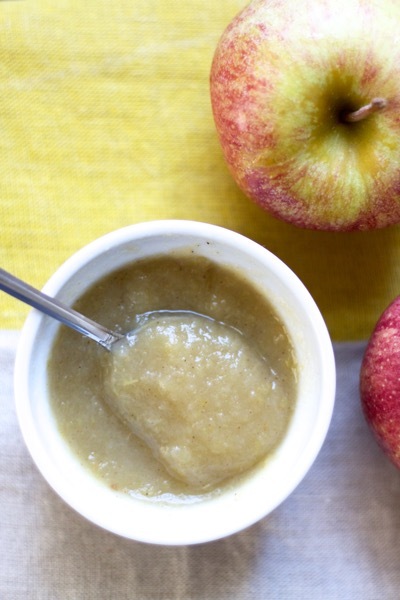 Taste the applesauce and stir in cinnamon. Serve warm or chilled! 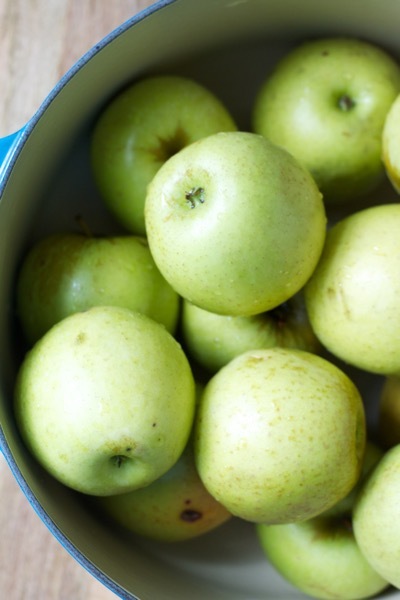 To freeze, put chilled applesauce in a Mason jar, tupperware container, or freezer bag, leaving room for it to expand. I usually get a box of blemished apples delivered with my Produce Box, and I’ve made applesauce with all different types of apples (sometimes I don’t even know what kind I’m using). If I’m buying from the store, I usually use a mixture of 2 varieties of sweet apples that are good for cooking. Here’s a link with info about a lot of varieties! 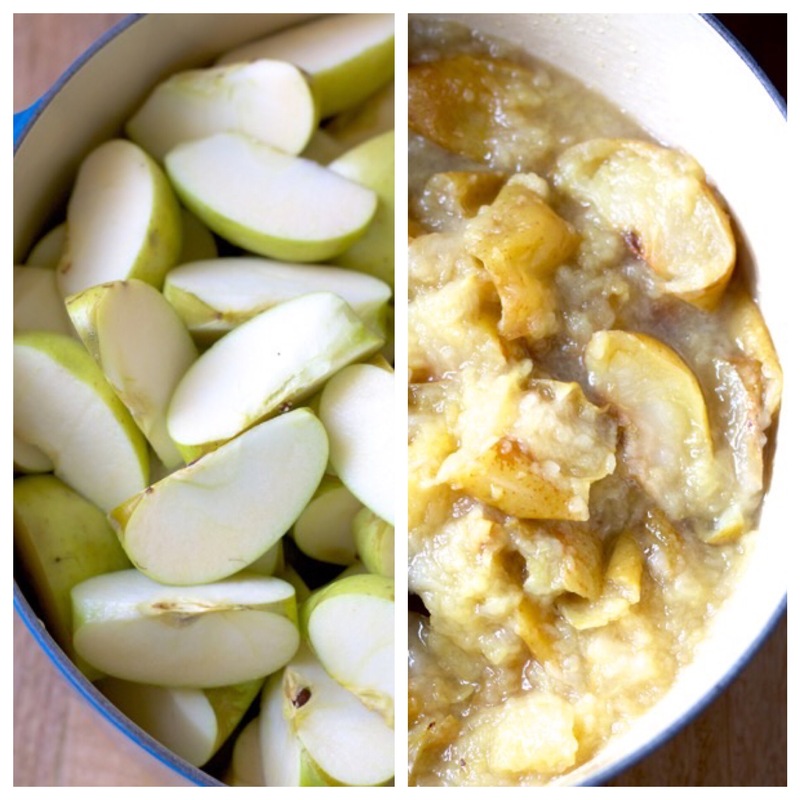 If you don’t have a Foley food mill, peel and core the apples before cooking, then mash by hand or use a food processor or blender to smooth out the cooked apples. To make 15 lbs of apples, I use 2 large pots or my huuuuge stock pot to cook the apples! Just increase the water and cinnamon in proportion. This post was originally published in December 2014. It has been updated with new photos and content! Enjoy! Good call, Mom! I’ll have to try it with skins in the Ninja and see if it works as well as the Vitamix!